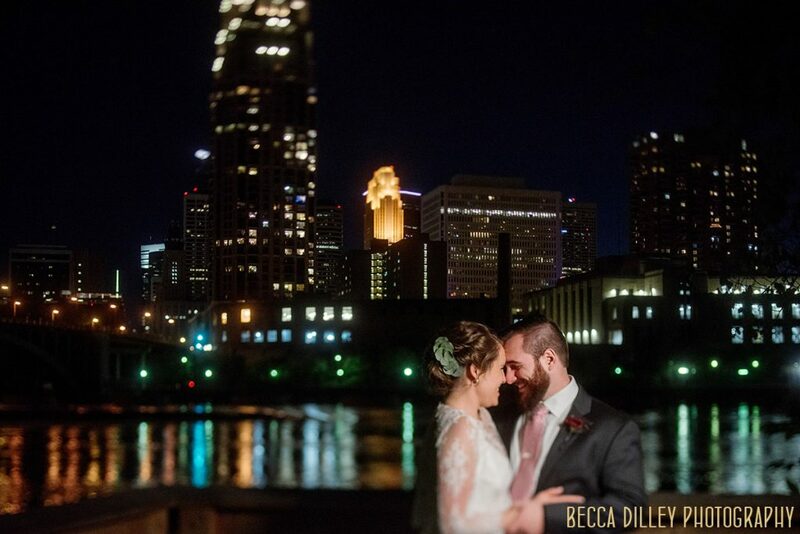 If you are looking at the Nicollet Island Pavilion for your wedding location, chances are that the amazing views of downtown Minneapolis are a major reason you love it. Couples planning a wedding at Nicollet Pavilion often wonder how well the rest of the spaces work for photography and what locations I recommend for formal and candid photos during a wedding. 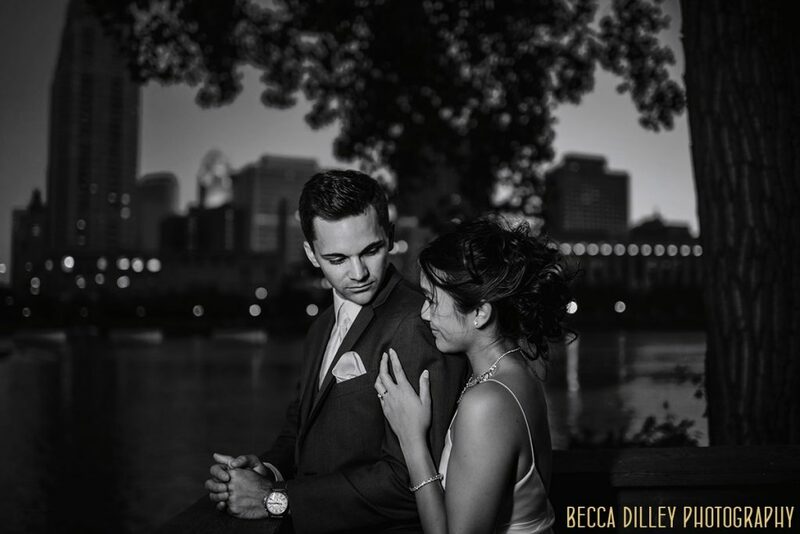 Even with those awesome views, it is worth thinking about how you want to use the space inside the pavilion and on the rest of Nicollet Island for your photography. The good news is that there are a huge variety of choices, even in bad weather. Back to the ceremony with perfect light. Obviously, the views across the Mississippi river are stunning any time of day. 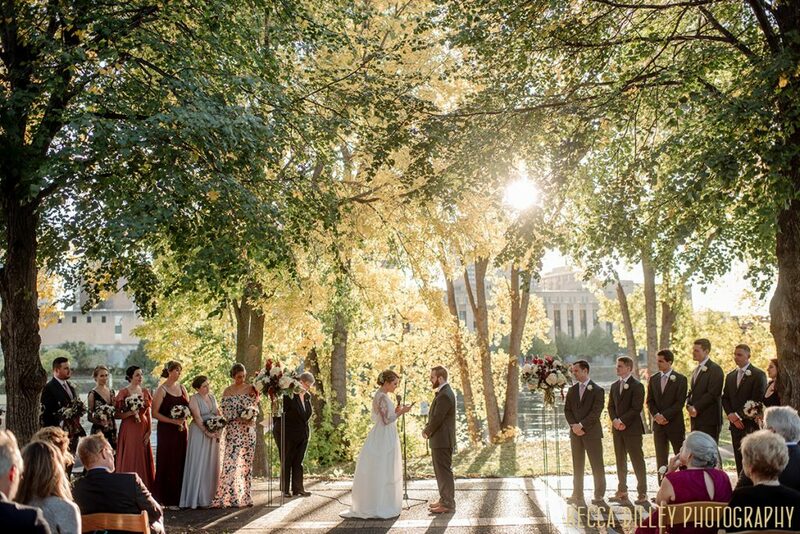 It is a gorgeous back drop for a wedding ceremony. 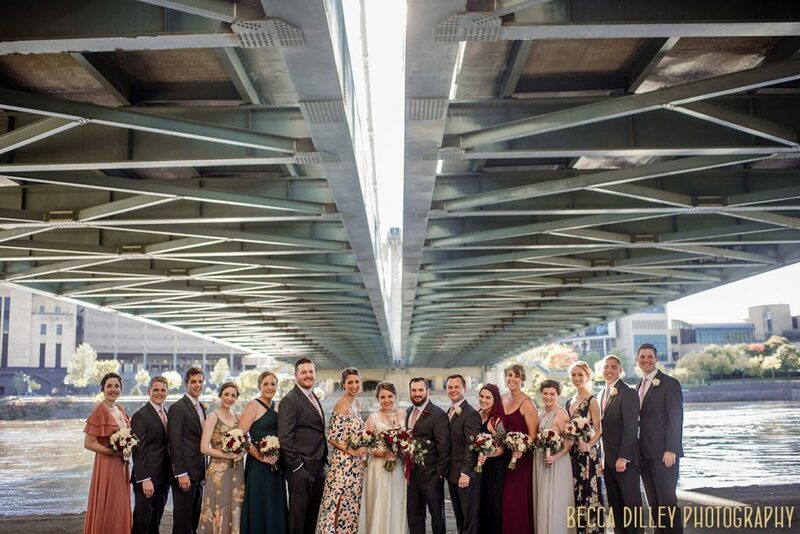 Over cocktail hour, your guests can see the entire history of Minneapolis – St Anthony Falls which powered the old mill buildings; Hennepin Ave bridge and the old Grain Belt beer sign; and the modern Guthrie theater. That same background becomes moody and magical in the evening when the city lights come up and reflect over the Mississippi river. 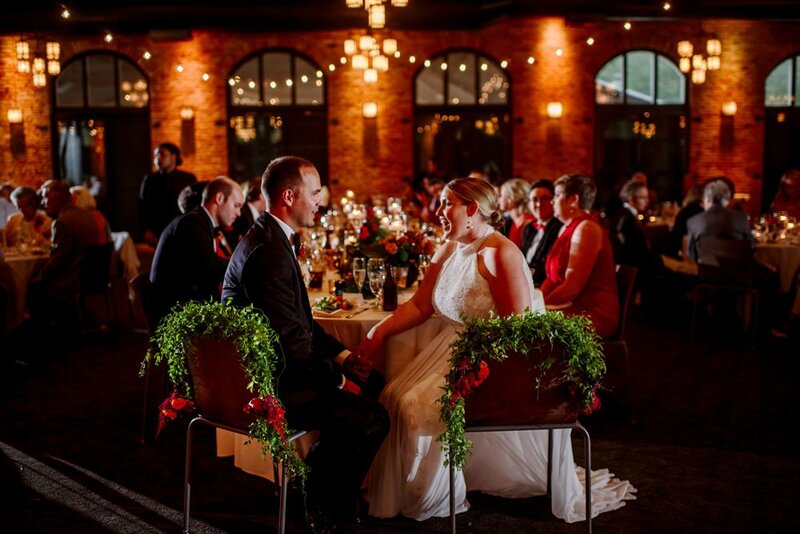 Taking a moment away from your guests during the evening is definitely worth while: it is a gorgeous backdrop, but also a nice moment of reflection at the end of an amazing day. On one hand – this image is all about technique (tilt shift manual focus lens to get the skyline and the couple in focus, led light held to the side, color balancing for the skyline). One the other hand, it is the most simple- two people, together, in a city they chose. 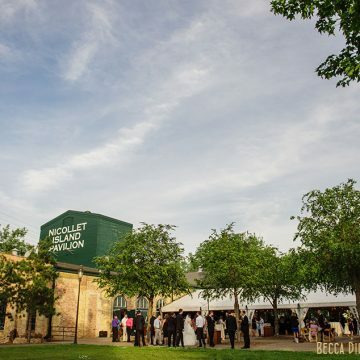 Depending on your timing, it can be worth your while to take advantage of the rest of Nicollet Island. During spring, the lilacs bloom around the island. In the fall, the trees are vibrant yellows and golds. Even in winter, the combination of river and architecture means that spaces don’t feel sparce. I definitely love the Merriam Street bridge that connects the island to St Anthony Main. The spaces under the Hennepin Ave bridge can be a little more modern and protected from the elements. 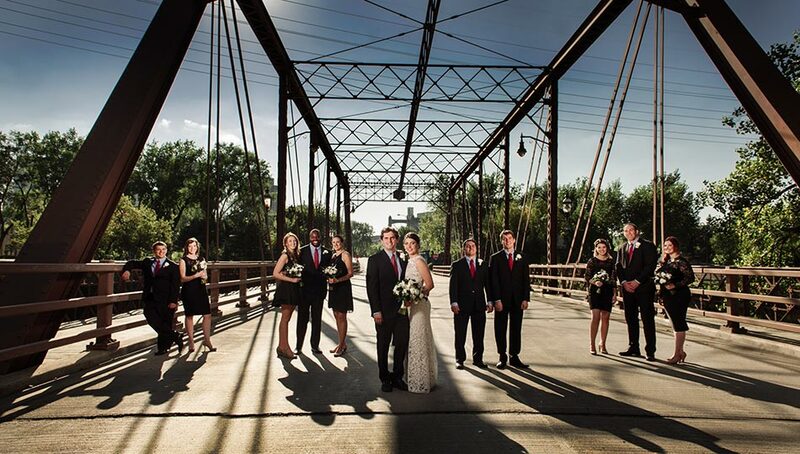 This flash composite image balances the harsh sunlight to make a more cinematic portrait of the wedding party. The inside of the Pavilion is quite large (it can almost be cavernous at times!). The wall lights and hanging cafe lights definitely work to make the space feel more intimate in the evening. The brickwork can also be a lovely backdrop for indoor family portraits in case of rain. Having a plan for using lighting in this space is vital for photography that captures the feel, but also feels natural and a little elevated. Getting crisp images while showing off the moody space is a balancing act – for this image, I used off camera lighting on the side of the room to bring in a little pop- it is no more distracting than a regular camera flash (and much less distracting than most cell phone “flash”, but it brings a little pop of separation and keeps the focus on these two love birds. I don’t always recommend asking a photographer to see weddings at your specific venue. It can be just as useful to see images at similar spaces or under similar conditions. That said, Nicollet Pavilion is such a specific interior space that seeing examples of photos inside will definitely help to narrow down a photographer. 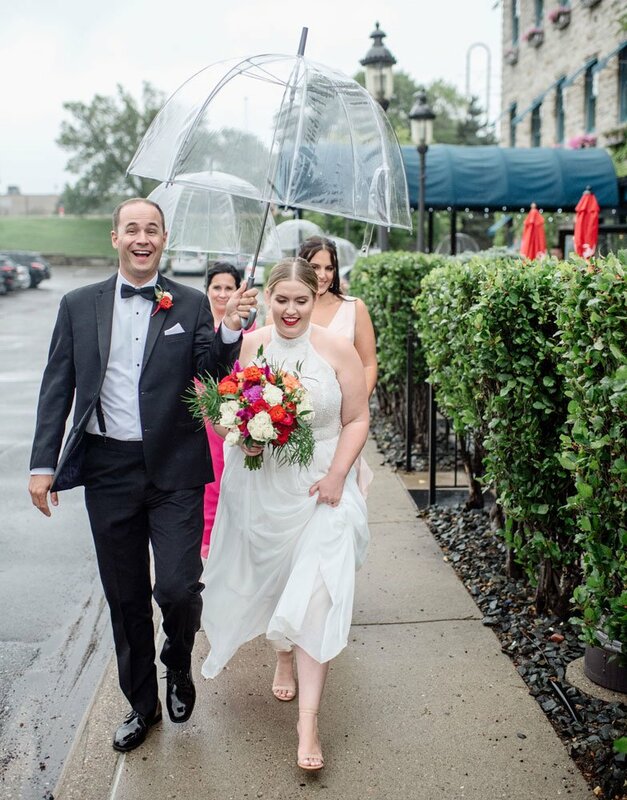 Clear umbrella for the win! 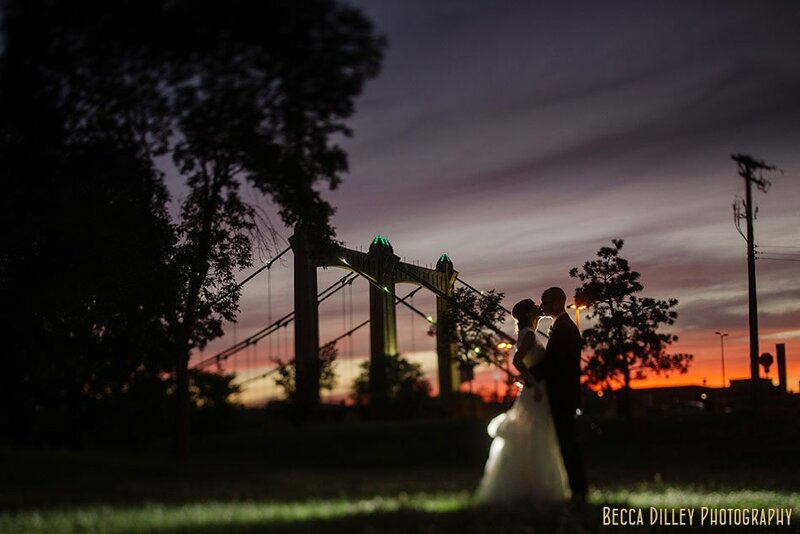 If you are planning your wedding at the Nicollet Island Pavilion, I’d love to talk with you about photography!